Title: 'Primae Partis Asiae accurata delineatio' engraved by the van Deutecum brothers, based upon an earlier map by Gastaldi. 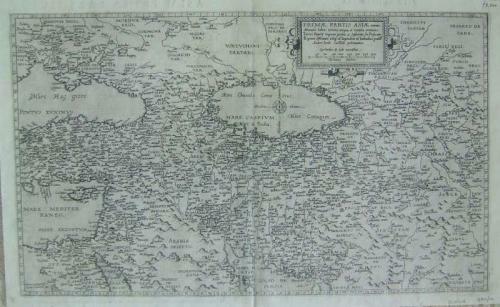 De Jode's rare map of the region, bounded by the Black Sea and Mediterranean in the West and Afganistan and Central Asia in the East. Cyprus is prominently shown in the Eastern Mediterranean. De Jode's was a competitor of Ortelius. His atlas 'Speculum Orbis Terrarum' did not enjoy the same commercial success as Ortelius, despite many modern commentators alledging the superiority of many of De Jodes's efforts. Consequently, today his maps very rare and highly desireable.